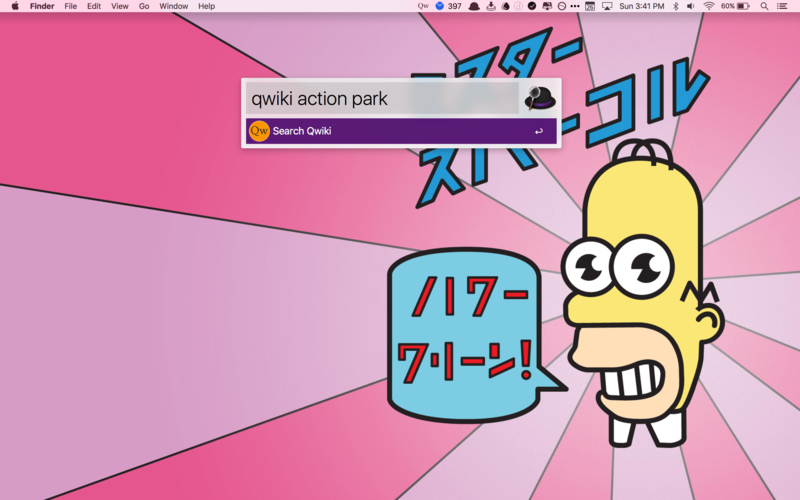 Qwiki 1.1 by Christopher Hannah sits in the menu bar of your Mac. Clicking the Qwiki icon displays a search box as well as a gear button, from which you can access preferences and quit Qwiki. Search results immediately start appearing as you type in the search box minimizing the amount you have to type to find what you want. Alternatively, you can search Qwiki with Alfred or any other similar app that supports URL schemes. Qwiki has a URL scheme so you can search with apps like Alfred. You can navigate search results with your mouse or trackpad, or by using the arrow keys. Opening an article in Qwiki’s drop-down window is a simple matter of clicking it or highlighting it with the arrow keys and pressing Return. In addition to scrolling with a mouse or trackpad, you can scroll from the keyboard using the Space bar. To move back a level click on the search button at the bottom of the drop-down window or press the Escape key on your keyboard. Qwiki's controls are along the bottom of its window. If you don’t want to read articles in Qwiki’s drop-down window, you can set the preferences to open articles in your default browser. This is a nice option, but I would also like a dedicated button at the bottom of the Qwiki window that lets me send an article to a browser for reading more carefully after skimming it in Qwiki. I would also like to see preferences for opening Qwiki on login, creating a keyboard shortcut for activating Qwiki's search field, and bookmarking Wikipedia pages for later viewing. Qwiki can copy plain, Markdown-style, or HTML-encoded links with the link button at the bottom of the Qwiki window. The type of link generated depends on the settings you have chosen in Preferences. Qwiki also includes a share button that lets you share links using the Mac share sheet. 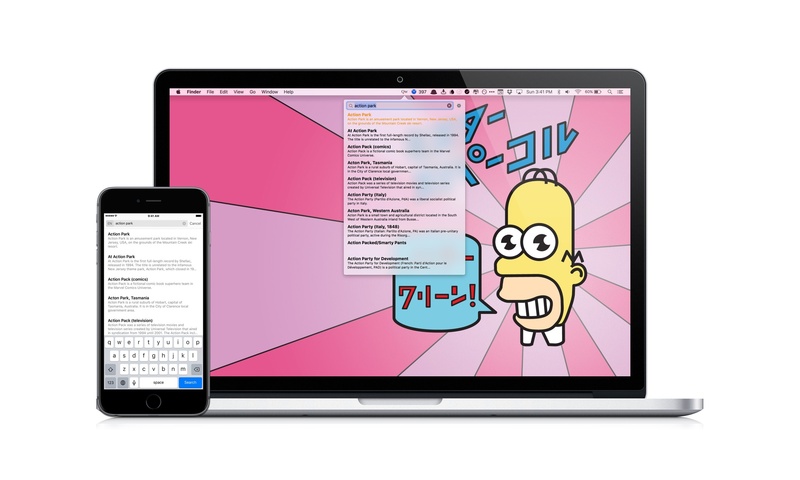 The full OS X share sheet is available in Qwiki. I have too many menu bar apps and was initially hesitant to add another with Qwiki. But unlike some apps, Qwiki feels perfectly at home in the menu bar. If I’m writing and need to look something up quickly, having it there in the menu bar is incredibly handy and helps keep me from getting distracted by the dozens of tabs I typically have open in Safari. 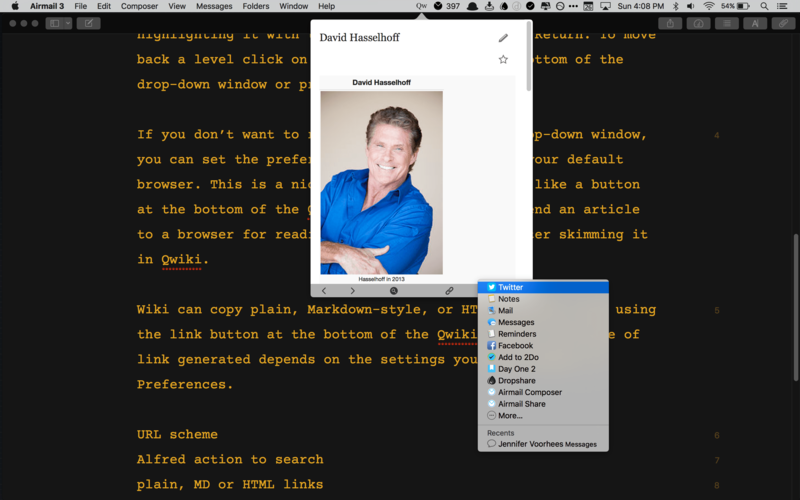 Instead of going down a rabbit hole in Safari, I can get the information I need without leaving my text editor. Wonder from Jonathan Thiry, which debuted today on the App Store, is cut from similar cloth as Qwiki. Like Qwiki, Wonder has a simple, bare-bones interface. The main screen has a search box at the top and a list of recent searches. Wonder’s search results update as you type. You can navigate among articles you have viewed with the arrow buttons at the bottom of the screen, share a link via the iOS system share sheet, and access the table of contents for the article, which makes navigating longer articles fast. 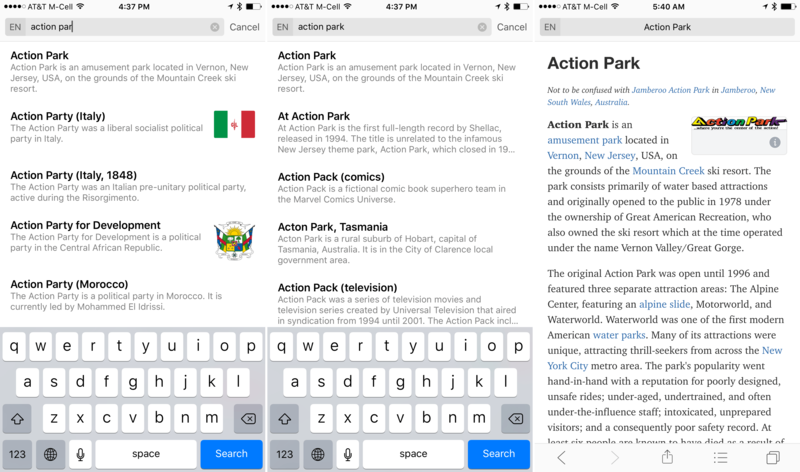 Wonder updates your search as you type. The final button on the bottom of Wonder’s screen accesses a card-style view that lets you save articles for later. A plus button at the bottom of this view brings you back to the search screen so you can perform a new search. The article cards are a neat idea that let you move through Wikipedia quickly, saving articles as you go for closer reading later. You can save articles for later in Wonder. Another nice touch is that moving to landscape mode moves Wonder's navigation controls from the bottom of the screen to the navigation bar at the top of the screen. 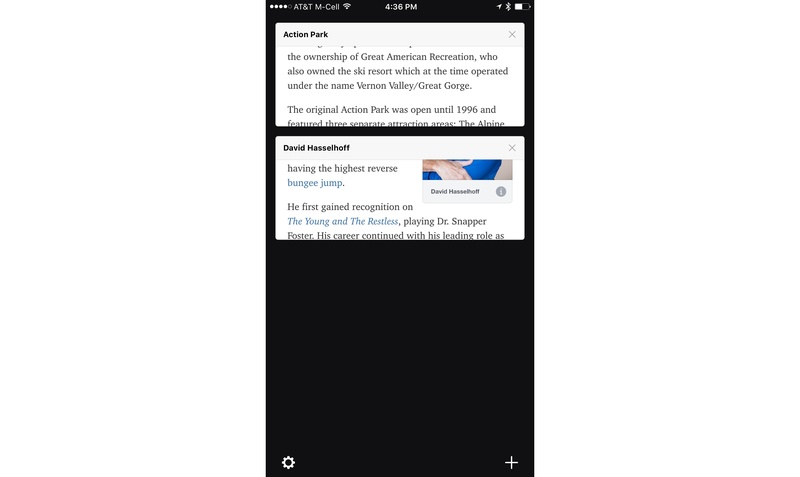 This saves vertical space making landscape reading on an iPhone a better experience. One navigation feature that I found a little confusing, however, is that if you are in card view, opening a card, searching and tapping the card view again overwrites the card you started in. To avoid this, you need to tap the plus button in card view so any subsequent search creates a separate card. Two features that I would like to see added to Wonder are dedicated Markdown and HTML link generation action extensions and iPad support. 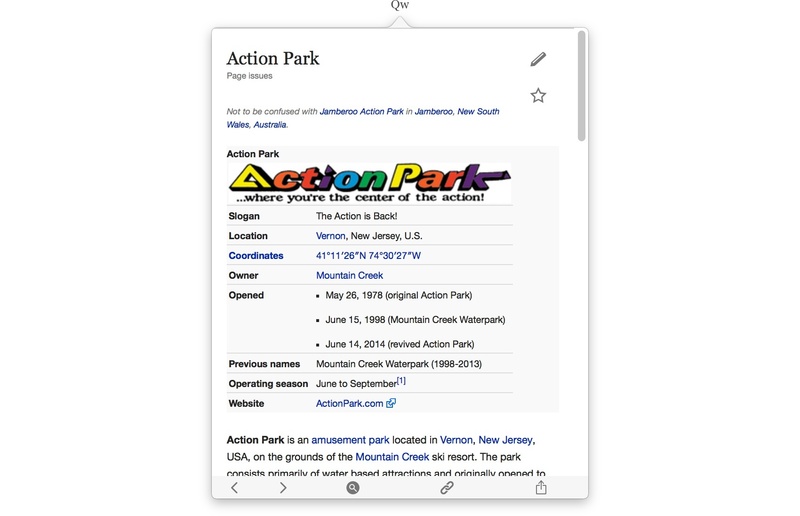 Qwiki and Wonder take a similar approach to Wikipedia research with simple interfaces that are singularly focused on search, fast navigation, link generation, and sharing. Both apps could use a few additional conveniences to make them even more powerful for students, writers, and anyone else who finds themselves researching on Wikipedia, but they also deliver on their core purpose and vision of finding, browsing, and sharing Wikipedia results quickly. Qwiki is available on the Mac App Store for $1.99. Wonder is available on the App Store for $4.99.